Acupuncture is a powerful medicine which aids in strengthening the immune system and serves to prevent disease, control pain, and increase both the ability to function and the quality of people’s lives. Acupuncture is a well-developed whole health care system based on natural energetic laws. This is because acupuncture is a method of healing from within. By activating your own energy, and guiding it, you are able to heal yourself from the inside out. Did you know that acupuncture can be subsidized by your insurance? Click the button below to verify if your insurance will cover acupuncture. At our CryoCure Center location in Hewlett, NY, we offer Acupuncture and Facial Rejuvenation Acupuncture. Acupuncture utilizes an energy system in your body that works like electricity. This energy follows pathways, called meridians, which traverse your extremity and torso, and connects with the internal organs. It is a painless, non-surgical method of reducing pain and the signs of aging. Acupuncture is a treatment that is based on the principles of Oriental Medicine and involves the insertion of hair-thin needles into specified areas of the face, ears, neck, hands, trunk, and legs, along channels (meridians) of energy called Qi (pronounced “chee”). Specific points are chosen to stimulate the body, face lifting affect, promote circulation of blood and collagen production, and reduce inflammation. What Should I Expect In An Acupuncture Session? The process begins with a client making an appointment for consultation. During consultation, our certified acupuncturist, Inga Fruman (who is also the owner of CryoCure Center) will discuss what is happening with your body and how these issues came to fruition. Next, we begin treatment, and depending on your areas of pain and/or concern, we may have you lay on your back or stomach. Considering that different points have different effects, laying on your back or stomach may change with each visit. Once we locate the “acupoints,” we inset hair-thin needles that – for most people – is completely painless. After the needles are in place, we allow you to relax for a while, which gives the acupuncture needles time to stimulate energy flow in your body. When this energy is flowing properly, the body is better able to heal itself. Once we remove the needles, this will conclude the sessions, and many clients describe feeling a reduction in pain and feeling more relaxed. It is a safe and gentle process that promotes health and wellness. Most people are surprised at the depth of relaxation, the intensity of energy and sense of well-being and healing which occurs from the re-balancing of energy. Often relief from symptoms is felt immediately, although comfort may occur in the following days (or weeks) depending on the severity of symptoms. 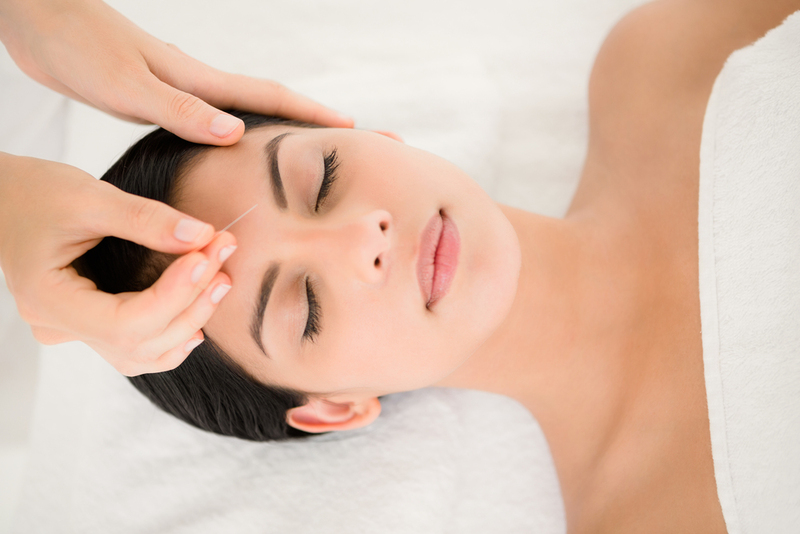 Acupuncture can result in increased collagen production, firmer skin and muscle tone, tightening of pores, brightening of eyes, reduced acne due to hormonal balance, and reduction of stress. Western medicine notes that acupuncture needles stimulate the nervous system to release important neurotransmitters and hormones. For Facial Rejuvenation Acupuncture, you can erase 5-10 years from the face, with results apparent after just a few treatments. Fine lines may be entirely eliminated while deeper wrinkles may be greatly diminished. Bags under your eyes can be reduced, jowls firmed, puffiness eliminated, droopy eyelids lifted, and double chins minimized. You will find that you will look forward to treatment for the many benefits that are received from acupuncture. Many people who have lived with their condition for so many years believe they will just have to make do. Others live with the pain thinking that “someday” it will go away. Acupuncture has succeeded in many cases where other treatments have not. At CryoCure Center, we strive to bring out the innate beauty and radiance of an individual by promoting non-invasive and innovative methods of obtaining optimal health! Information provided here is not to be considered medical advice. Full body cryotherapy is not a medical device. The material contained within this website is for informational purposes only. The cold therapy products and equipment have not been tested or approved by the FDA or any other US government agencies for the treatment of any illness or disease. Use at your own risk.